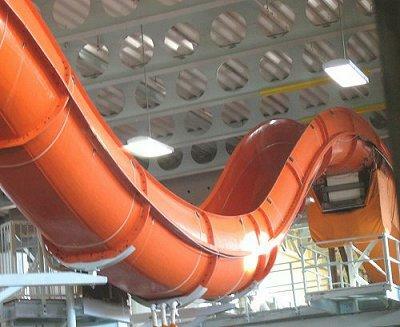 This slideshow includes pictures of indoor slides. There are some fantastic indoor water parks in Pennsylvania. The winter weather can be quite harsh and cold in Pennsylvania, yet indoor water parks provide an enticing and exciting tropical atmosphere. There are a few wonderful indoor water parks to choose from in the state of Pennsylvania. Pennsylvania is a large state which offers some wonderful water parks to choose from. Splash Lagoon is a popular water park located in Erie, Pennsylvania. The park is divided into four major sections. These sections include the kid's zone, wild slides, takin' it easy, and extreme rides. The kid's zone features shallow water attractions exclusively for children. The Sports Pool, Tiki Tree House, Monkey Shines Island and Adventure Bay are the four areas of the kid's zone. Takin' it easy features slow rides that are ideal for those who want to take it easy. Paradise Cove, Frog Pond, Lazy River, and the Lava Pool are the four attractions of takin' it easy. Wild Slides features fast and exhilarating body and tube slides. Shark Attack, Big Kahuna, Maui Waui, Python Plunge, and Black Hole are the featured attractions of the takin' it easy section. The extreme rides section features the high paced and most thrilling rides in the park. Cyclone and Hurricane Hole are the attractions for those brave enough to enter the extreme rides section. Bear Track Landing Water Park is situated in the Great Wolf Lodge, in the Pocono Mountains. This fabulous indoor park features 78,000 square feet of excitement. The park features 11 waterslides, 6 pools, and a fantastic four-story Tree House Water Fort. The state-of-the-art indoor aquatic facility utilizes almost 380,000 gallons of water. Attractions range from the mild to the wild. Children and parents will enjoy the exciting thrill of this water park. Conley Resort Water Park is a golf resort located in Butler, Pennsylvania. The water park features slides, a sauna, a shallow pool and a hot tub. Other attractions include a pirate ship with a water cannon. There is also a party room with many fun games, and also a spa. Waldameer Park and Water World is located in Erie. Waldameer Water Park features many fun attractions. Enjoy the giant body slides, or take a ride down the open, single-person tube slide known as Wild River. Raging River is an amazing two-person tube slide. Other attractions include the Endless River, Free Fall Slide, Bermuda Triangle, and Speed Slide. There is also an enormous hot tub, and a Tad Pool area with wading pools and five slides that are perfect for children. Water World also features their Sundeck Café, full of delicious foods like burgers, hot dogs, French fries, and ice cream. The Pizza Beach Café features delicious pizza and nachos.